New details emerged as a teenager accused in connection with a New Hampshire highway crash that killed an off-duty Massachusetts police officer appeared in court Friday morning to face new charges related to the officer's death. Nineteen-year-old Michael Ricci waived his arraignment in Rockingham County Court on the charges of negligent homicide, four counts of reckless conduct and second-degree assault. The state and his defense agreed on a $10,000 bail with conditions, including no drugs or alcohol or driving. His bail was posted following his court appearance. 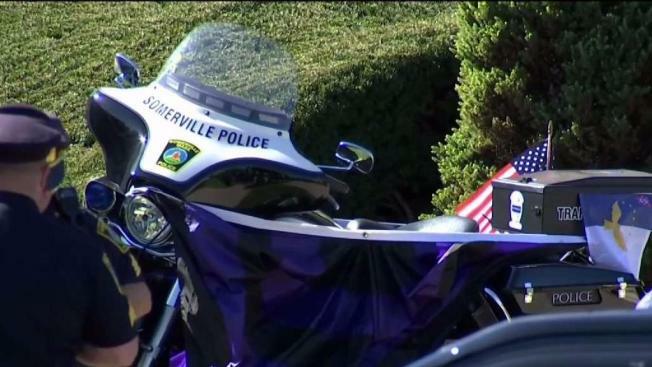 The Burlington, Massachusetts, teen is accused of causing a crash that killed 55-year-old Somerville officer Louis Remigio earlier this month. The crash also injured two other people and damaged several other cars. Outside court Friday, one of Ricci's lawyer said "this was a tragedy." State police said Ricci was racing other vehicles in his 2013 Mercedes on Interstate 95 in Hampton, New Hampshire, on Oct. 8 while on their way to take part in "Import Day" at the New England Dragway in Epping, when he veered into oncoming traffic in an illegal U-turn, hitting a motorcycle driven by Remigio. Ricci has an extensive history with law enforcement dating back many years which includes traffic and drug offenses, according to sources. His license has since been revoked. Remigio, a 30-year veteran of the Somerville Police Department, died the following day after the crash. He left behind two daughters, whom he had been raising as a single father following his wife's death last year. Ricci's next court date has not been scheduled.